This charming, historic Adobe. was built in the 1920's as a corner market. The building has fireplaces, wood floors, 14 ft. ceilings and skylights. 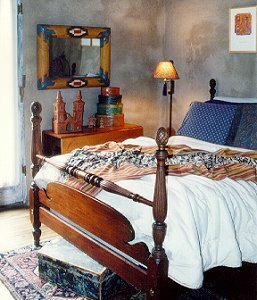 It is furnished with folk art and antiques from Mexico and the Southwest. The old meat locker is now a kitchen. 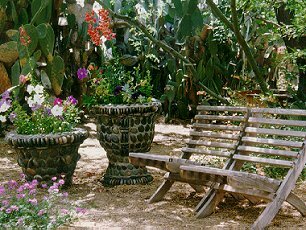 The yard/garden is filled with cactus, mesquites, flowers, humming birds and fountains. There are seating areas throuohout the yard, perfect for drinking coffee, reading and bird watching. 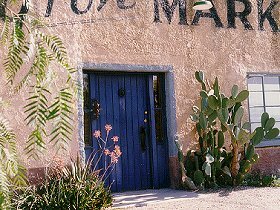 The Elysian Grove Market is located in an Historic Barrio, next to Tucson's downtown arts district. We are within walking distance of the Tucson Museum of Art, the Tucson Convention Center, interesting shops, outdoor cafes, galleries and the University of Arizona campus. We are near Mexico, the Arizona Sonoran Desert Museum and an 18th Century mission. Ancient Indian ruins and cliff dwellings are within driving distance. We have four bedrooms furnished with art, tribal rugs, and comfotable antique beds. Breakfast, each morning, includes Mexican pastries or 'pan dulce'; fresh fruit, cheese and coffee. Music is always played and coffee, of course, can be taken in the garden. Wood is always available, so evening fires can be laid in our two fireplaces. The garden and Inn are perfect for weddings and events. Catering, flowers, music. etc. can all be arranged. Ask re: rates for weddings and events. Rooms are $85.00 per night, including breakfast. Please call for additional information and reservations.